S. typhimurium and E. coli, used in Ames test, are prokaryotes and therefore do not exactly reflect the conditions in humans. In mammalian organisms chemical molecules are often metabolized in the liver. This can lead to the generation of mutagenic metabolites. S9 is a liver extract (e.g. rat, hamster or human) that contains active liver enzymes (P450 activity) simulating the hepatic metabolism in in vitro assays. The P450 activity in S9 can be increased through induction with pure chemicals like Aroclor1254 or Phenobarbital. Metabolic activation systems based on chemically induced S9 have been widely applied in in vitro studies; e.g. the Salmonella mutagenicity test and the micronucleus test. S9 is the supernatant of homogenized liver (in 0.25M saccharose) that has been centrifuged at 9000g for 10min. For gaining the liver mircrosomes the homogenized liver is centrifuged at 100000g for 1h. Lyophilized S9 is easy to handle and especially useful when an ultralow freezer is not available. It is ready to use after reconstitution with the label volume of cold, sterile, purified water. Please ask for availability of S9 Mouse! Microsomes can be prepared according to your specifications. 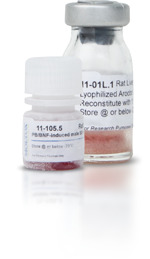 Ready-to-use SD Rat S9 Mix MUTAZYME™ is available as well. TRINOVA BIOCHEM now offers cryopreserved pools of rainbow trout S9 fractions prepared and characterized in accordance with the OECD guideline 319B, manufactured in Germany. Each lot comes with a Certificate of Analysis (CoA) including pool size and SDS-PAGE analysis. The OECD Test Guideline 319B “Determination of in vitro intrinsic clearance using rainbow trout liver subcellular fraction (RT-S9)” was released on June 25, 2018. For more information, please download our Product Information below!